Prairie Grove School District is hosting a guest speaker, Stephanie Siete, on August 8, 2017 at 7:00 PM. The event will be located at the high school cafeteria and is open to the public as well as surrounding schools. Stephanie Siete began her career with Community Bridges, Inc. (CBI) in 2002 as a drug prevention specialist and has worked her way up in the prevention field educating students, teachers, parents, police and universities about drug dangers and trends. Over the years, she moved into the roles of the Public Relations Director and Community Education Director to her recent position of Public Information Officer (PIO) as of March 1, 2017. 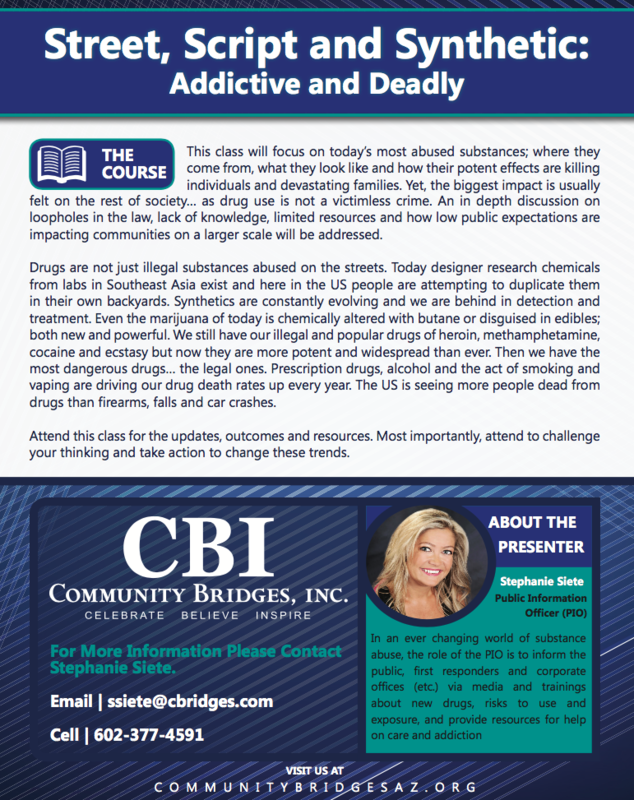 This class will focus on today’s most abused substances; where they come from, what they look like and how their potent effects are killing individuals and devastating families. Yet, the biggest impact is usually felt on the rest of society... as drug use is not a victimless crime. An in depth discussion on loopholes in the law, lack of knowledge, limited resources and how low public expectations are impacting communities on a larger scale will be addressed.